Mach1 Kart can present a strong new factory driver: Swede Douglas Lundberg. The 2014 European vice champion is going to start at the World and European Championships as well as the German Shifterkart Championship for the German manufacturer. Mach1 Kart is still on the rise and is happy about their new driver Douglas Lundberg. At the kart fair in Offenbach on the Main, Mach1 Motorsport team leader Martin Hetschel and Douglas Lundberg set the seal on their cooperation. The Swede isn’t new to kart racing. In 2014 he won at the finale of the KZ2 European Championship is Kristianstad and thereby secured the vice title. 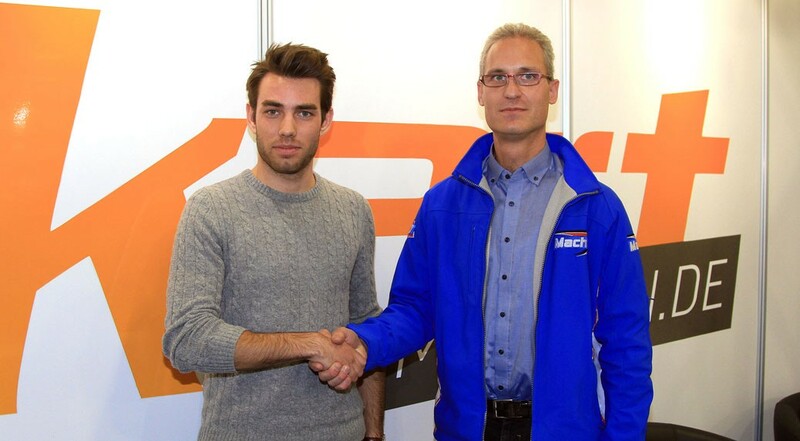 After a mixed year 2015, he wants to get back to the winning ways in cooperation with Mach1 kart: “I’m really looking forward to working with Martin Hetschel and his team. The chassis has highlighted its potential numerous times during the past years and I can hardly wait to start”, Lundberg summed up. He’s going to start at the KZ1 European and World Championships. He’s putting special focus on the World Championship – the race is going to take place on his home track in Kristianstad. “The race track is only a couple of kilometers away from my hometown. We’re going to test there a lot and will start at the highlight of the season extremely well prepared”, Lundberg said determinedly. The first highlight is already awaiting Mach1 kart in two weeks. From January 29th – 31st the annual in-house exhibition is going to take place in the workshops in Meimsheim. Next to numerous bargains the visitors can also get an insight into the successful chassis’ production and can get information about the current models. Official English Site – Kartsport made in Germany!